Adam Morgan admits the Halifax fans have only seen the best of him in glimpses so far but believes he will score goals in the National League. The striker scored seven in his first six games after joining Town in December before netting just twice in the remainder of the campaign. The former Liverpool youngster displayed outstanding control, vision and technique in his first few games before tailing off badly and dropping down the pecking order for the rest of the season. When asked if Town fans had seen the best of him yet, he replied: “Maybe in glimpses they’ve seen the best of me but I want the fans to really like me. “It’s important to me at every club I go to that the fans like me as much as possible, as well as the manager and the players. “I want to be appreciated. I’m not too sure if they do, I hope so. 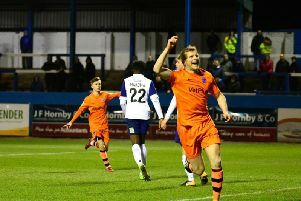 Morgan started just 13 of Halifax’s 26 games after joining them from Curzon Ashton mid-way through last season, and scored nine times. “I thought I had a good season,” he said. “When I was called upon I played my part. “Even off the pitch I supported the lads because it was all about getting the club promoted and back to where they belong. And I was happy with the part I played. “I had a good start. I’ve always believed I can could score goals if I play games. Morgan says he has a goals target in mind for the season, but is keeping the number to himself. “I feel fantastic,” he said, looking ahead to the new campaign. “It’s the fittest I’ve felt in four years because I was doing a lot of work in the off season. “I chose to go on holiday early, and then I was supposed to go on another holiday but chose not to go because I was working on getting fit and I wanted to be as sharp as I could. “I’ve never played in this league before but I know that every game will be difficult and will bring it’s own challenges. “We’ve just got to focus on ourselves. “I believe I will score goals but I’ve slowly been adding other bits to my game that the manager wants. “Things have happened in the past but I don’t look back. For whatever reason I’m playing at this level. “But I do believe I am capable of playing at this level and doing really well. “I want to play my part and help the manager and the club. I’ll give it my best. And Morgan believes the club should be aiming higher than just staying up this season. He added: “First and foremost you have to get enough points on the board to make sure you’re safe. “But there’s no way on earth we’re just looking at survival.